Who has shot the biggest deer so far on the Forum? I know it wasn't me. I shot a buck that I thought was a doe and when I started feild dressing I was in for a surprise. My son shot a similar one. I'm not one to just look for the big bucks- I generally take what the good Lord provides and say thank you very much! Season isn't over with yet so I still have a chance at Mr. big. So who has got the biggest? 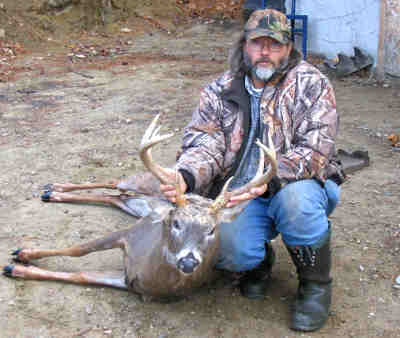 Re: Who has shot the biggest deer so far on the Forum? Don't know about you but I plan on shootin 2 of the smallest deer on the forum this weekend. remember man that thy are dust. Don't look for a challenge from down here. There are species of dogs that are bigger than our deer. Not I, I don't hunt. I did see a marsh hawk snag a grouse though, does that count? Don't the deer in your area have green skin and bite back and taste similar to chicken? Last time I went huntin' I was 17, got up in the woods, it was 4 am, it was warm and dry, and the next thing I knew I was waking up, the sun was up, it was 9 am and I was sore. And the woods was full of guys wearing orange. I went home and decided it was more fun sleeping in bed. The last deer I got was four years ago, though. Roadkill, thy name is Buck. A pic of mine is on the OUTDOOR ACTIVITIES section under " opening day 05"
No deer, but I got 2 turkeys during black power. I got a 7 point with a 16 1/2" inside spread last thursday. Made some jerky from an internet recipie out of the front qrtrs taste very good. Have to cut up the rest tomorrow. Well Moose hunter, you are most likely gonna win. That was one nice buck. We have until the end of the month then muzzle loading season so I still have a chance to beat you but I'll have to admit it is not looking good. my daughter shot a 6x6 mule deer buck, I shot a 4x3 buck, and a 5x6 bull elk. Now to put pics in the gallery! That's pretty good shooting! Sounds like you got a couple freezers full. If it's got to do with making sawdust; count me in! Shot an 8 pointer, but won't show the picture because of poor quality. Shot through the window and screen. By the time I got outside with the camera he had left. Well Okie, I would woud have to say for THIS year it looks like MH has the biggest Rack on a deer but what are we going by in your question. Animal size? I may have that honor for now, or until Norm posts a pic of one of his Iowa monsters like we have. My deer field dressed 225lbs. Its the meat volume that counts, right? A man does not always grow wise as he grows old , but he always grows old as he grows wise . As bitternut did, using the 'right' equipment helps get the big ones home. 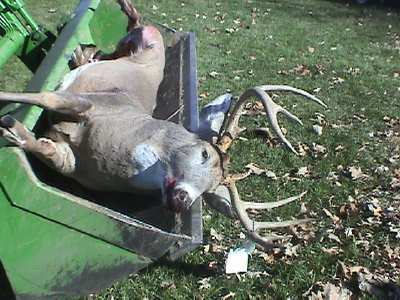 This deer is in a Deere tote. I shot a 8 point from a tree stand at a pond I had dug just for the sole purpose of hunting. about 30 yards late evening first day of season, there were two young does feeding under the post oak tree that I built the stand in and the buck was more interested in them than looking out for me. The rack was a perfect 8 point but not too large a spread. My wife ground up most into hamburger, mixed with bacon. We fried the back strap and tenderloin, made bar-b-q out of one sholder and saved a whole ham for a roast. I take the ham and season it with salt and pepper smother it in onions and butter and wrap it in about 4 or 5 layers of foil and cook it about 4 or 5 hours in the smoker. It is farm country here in southern Missouri and they have plenty to eat, it was really fat, been in someones cattle feeder probably. Aside from riding the bike, I could picture my grandfather doing that. He used to lug deer a long way because he never hunted near a road, had to go way back into the woods. The last deer he shot we had to get the Dang thing across 2 beaver ponds and clearcut. The deer dropped within 100 feet of where he shot it. Not the biggest but my 11 year old son got A 120lb spike buck. I dressed it for him,tied the rope on it and said there you go, He drags it about 10 ft, stops, ties the rope around his waist and drags it another 10 ft, stops and says " Dad this dang thang is heavier than me"
Some of you guys have got some nice deer. Kirk 225lbs is big-did you have it weighed or just aproximating? The Dang weather is really hurting my hunting time. We keep getting blizzard like conditions then when it is half way nice I have to work. Okie, we use to guess the weight but a couple years ago I got a whopper and took it to DNR and had the weigh it. I was way off. I guess it to be 200 lbs and turns out it was 249 field dresssed. After that I bought a scale from Cabelas and we make bets on who the closest is to guessing the weight . The buck I got this year was 225 lbs and the doe was 150. Our gun season was last weekend and the buck on the right was 210 lbs, 9 point and the fork horn buck on the left was 145 lbs. Makes those deer look REALLY big, dar. Still they are 'nice' deer. I wish I could take credit for the photo but it was Chad who took the pic and sent it to me. Thats his Dad in the photo, trying not to stand in the mud from washing out the deer. The deer have vanished for me, the only ones I've seen so far where dead on the roads. None have visited my corn pile or salt lick, Very weird 1st time occurrence. Nice deer Kirk, I'd be happy with either of them. 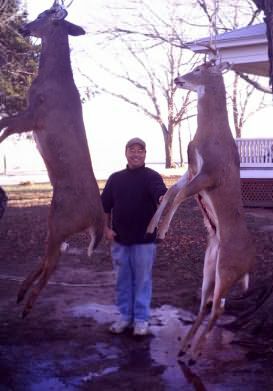 MOVED: Who has shot the biggest deer so far on the Forum? biggest log u have cut. Page created in 0.874 seconds with 39 queries.